For those of you who missed the extensive television coverage yesterday, here's a shot of the Santa Clara Vanguard marching through the intersection of Colorado and Pasadena Avenues in Pasadena, Calif., during the Rose Bowl Parade yesterday. The corps sported nearly 200 members and alums, and enjoyed coverage on HGTV, CBS, KTLA, KMEX, Telemundo, ABC and NBC, marching just in front of parade grand marshall John Williams. Note SCV general manager Dan Vannatta in the gray sportcoat in the bottom right of the picture. 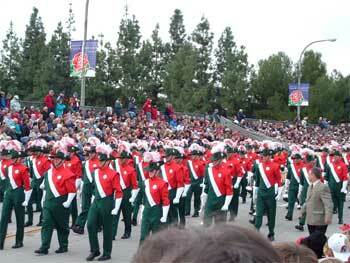 Ken Kilgus of Mareno Valley, Calif., who submitted this shot, reported that "SCV was great, as usual."